Ueno Masao graduated from the Shibaura Institute of Technology with a degree in architecture and studied bamboo with Honma Kazuaki. Since the 1980s, he has exhibited worldwide, installing outdoor pieces at the Grizedale Sculpture Park in England and the University of Zurich’s museum park. In 1991, his work was included in “The 20th Contemporary Art Exhibition of Japan” at the Tokyo Metropolitan Museum of Art and Kyoto City Museum of Art. His work is part of the Ruth and Sherman Lee Institute collection. 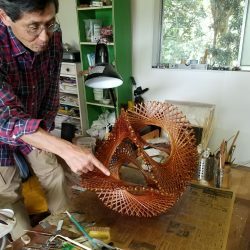 The artist picks madake bamboo in the mountains of Japan, dyes and lacquers the material, and finishes with gold leaf and gold powder, a technique he adapted from traditional wood artists. Tinged in gold, his pieces transform with shifts in light. Many of his ideas are formulated using computer-assisted design software. If you turn the bamboo culm inside out, you can live inside the bamboo. My house sits in a bamboo grove. On a hot dry summer afternoon, I can hear the subtle sound of explosions from the southern edge of the grove. It is the heated and inflated air inside the bamboo breaking the surface of the culm. In our bamboo grove the average eye-level diameter of bamboo is about 2.5 inches and the average nodal distance about 12 inches making the volume of the void between nodes of bamboo approximately 35 cubic inches. When I listen to this explosive sound I always think about the void inside the culm and wonder what the weather is like in this small void. Is it the same as ours; is it rainy or cloudy? People who live around the bamboo grove hear the sound of explosion and they sense a transparent light radiating from inside the bamboo. This is the beginning of the legend about the Bamboo Princess. One day an old man was walking through a bamboo forest and saw a light shining from a bamboo culm. He cut it open and found a baby girl inside. He and his wife never had any children so they decided to name her Kayuyahime and raise her themselves. After that, whenever the old man went into the bamboo forest to cut bamboo, he found money in the bamboo culm. When the 15th came, her father hoped she would not return to the moon, but as the moon appeared over the mountain, a gold light flashed and an angel appeared. Kayuyahime could not help following the light and slowly flew up into the sky hand in hand with the angel. The old man and his wife could do nothing but watch her leave.